Zunka/Zunka Bhakri is a famous Maharashtrian recipe. Traditionally it is prepared with onion and besan/chickpea flour and served with jowar or bajra rotis. 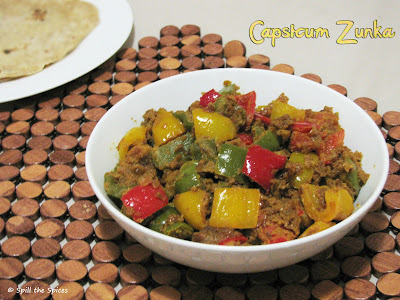 Zunka can be prepared with other veggies like okra/bhindi, capsicum, cabbage and spring onion. The blend of besan with capsicum gives out a good flavor and aroma. This dish does not need much preparation, so you can make this in an instant and serve with roti. It also goes well with rice and dal. 1. Remove the seeds of capsicum and cut them into cubes. 2. Dry roast the besan in medium flame till nice aroma comes. Keep aside. 3. In a pan, add 2 tbsp oil and add jeera. When it crackles, add ginger-garlic paste, green chillies and fry for a minute. 4. Then add onions and fry till they turn brown around the edges. 5. Add turmeric powder, coriander powder, red chilly powder and mix well. Fry for 2 minutes. 6. Add capsicum, salt and mix well. 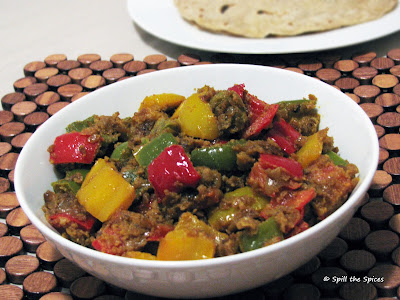 Close and cook for 8-10 minutes or till capsicum becomes soft. 7. Now add the besan little by little and combine well with capsicum. Add 1 tbsp oil and keep mixing in medium flame for 5-6 minutes. Do not cover at this stage. 1. I have used green, yellow and red capsicum here. You can use any color capsicum for this. 2. Roasting the besan helps in removing the raw smell and gives a good aroma when roasted again at the end. 3. Do not cover and cook after adding besan. 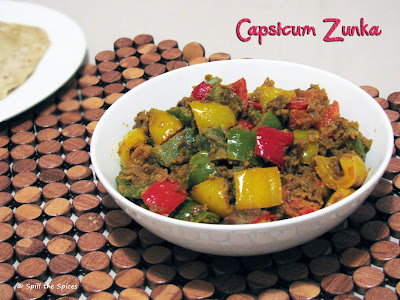 Lovely capsicum zunka!! Wonderful snaps!! Never ever knew the combination of capsicum with the rest will bring out such a wonderful outcome. Great serving for our white rice. Love this with rotis, looks so colorful too..
looks mouthwatering n delish,perfect with chjapathis!! we have same gujarati dish but with carrot too. coming soon to my space. but love the colorful use of pepper in it. Colorful and flavorful side dish. interesting name.. never heard it.. masala looks awesome.. Delicious capsicum curry I made it too. Came across your blog while searching for Capsicum Zunka. It looks gr8. I generally make it in a slightly different way. I mix besan with water and prepare the paste and pour it over the cooked (stir-fried) capsicum. Noted your recipe and will try just now as I have already cut the capsicum and kept it ready. Thanks.